In case you missed it, I’m getting married!! Umm, not going to help me much is it! So what’s a natural girl to do? I love my fro but I don’t want to rock it how I do every day for my wedding day. Believe me, I’ve tried wedding dresses on with veils when rocking my free fro…let’s just say whoever began the veil trend didn’t have an afro in mind. When I came across Black Girl with Long Hair’s bridal section early last year, that’s where I’d direct my bride-to-be readers. 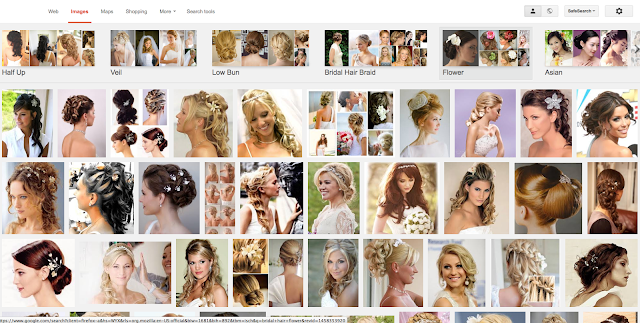 They have an awesome selection of different natural brides’ stories and great inspirational photos of how they wore their hair. But in terms of resources, that was it. Anyone else getting married this year or next? Who’s recently hitched? How did you wear your hair? Let’s share ideas and inspiration! 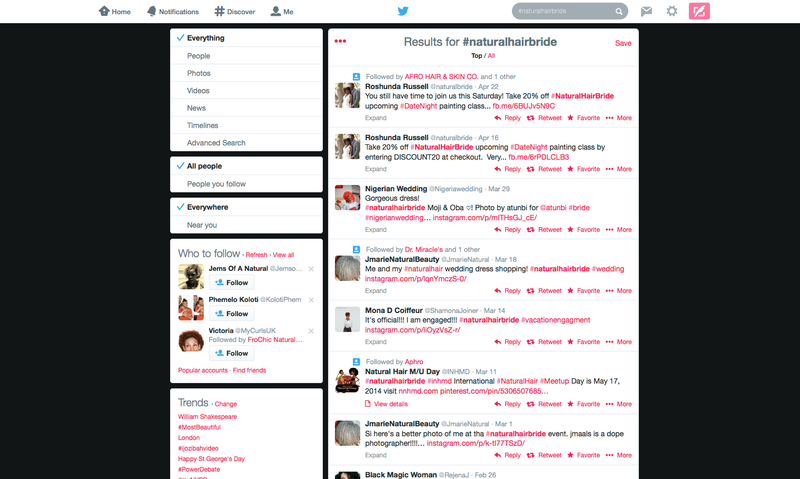 Follow and interact with my natural bride journey using #NB2B. Tag me with your inspirational photos or your own bridal styles. Excitement! Speaking of veils and how they're not friends with Afros. I've been making hair and neck accessories – which I think might work very nicely with an Afro. Unfort, I cant be 100% sure cause I have short natural hair. Check some out on my blog Slomokazi http://slomokazi.blogspot.com/ – I'll be doing some proper pics sooon and will actually feature an afro. Happy Planning and will def keep an eye out on your blog to see what style you rock on your big day. Hi Ugo, also glad you came back 😉 thanks so much, I'm really excited to share my photos with you all! Aww thanks so much for sharing. Very nice! Hi. I stumbled upon this blog wen I was looking for marley afro weave that resembles natural hair. Love the blog. I have an afro but mine is a bit thin and would love to add some volume with a weave. I'm in joburg. If anyone has an idea of where I can get this weave that resembles natural hair Pliz help. 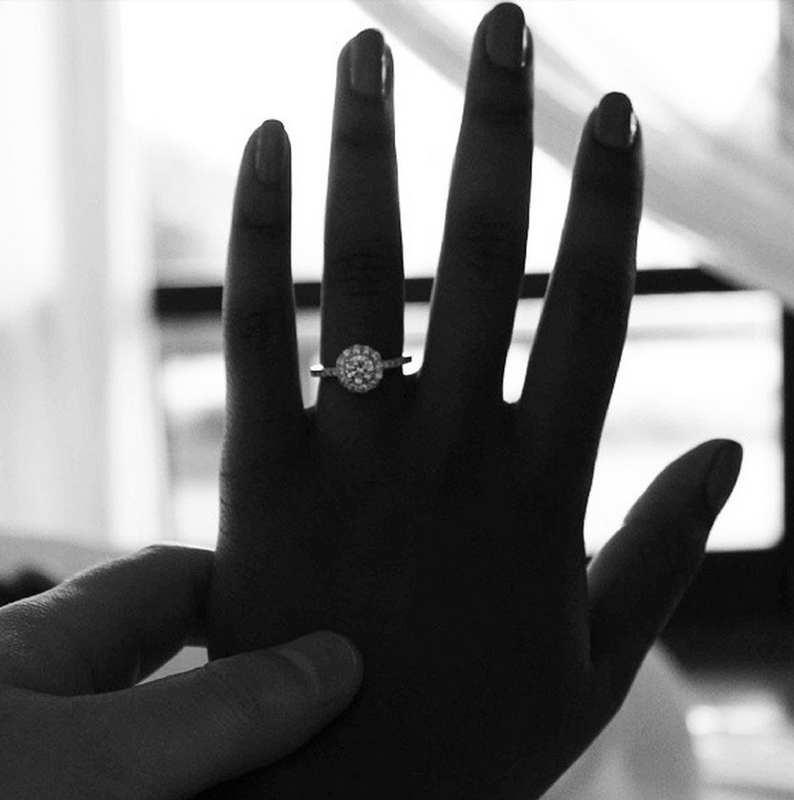 Oh and your ring is GORGEOUS! "let's just say whoever began the veil trend didn't have an afro in mind" #rotfl I know what you mean, my cousin chose not to wear one because she didnt want an updo and the veil kept "re-shaping" her mane. 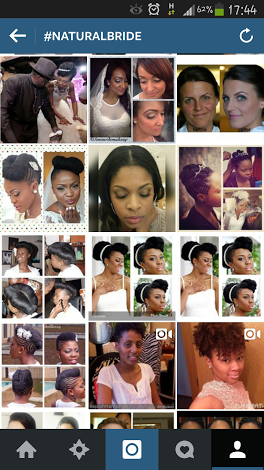 Pinterest "Natural Hair Brides", loads of inspiration. Also Black Girl Long Hair has a natural bride Pinterest page too. Check out this Pinterest link. All I typed was "Natural hair brides"